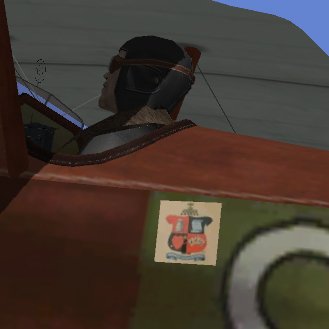 Squads in Aces High have the ability to upload custom "Nose Art". 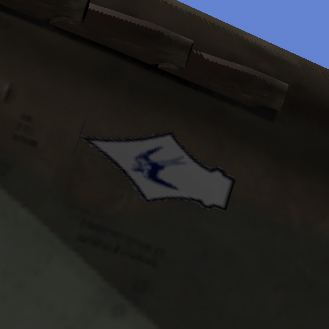 Once this has been approved by the staff of Aces High, the nose art is displayed on each squad members aircraft. This is our approved WWI arena "SWIFT" 72 Sqn. 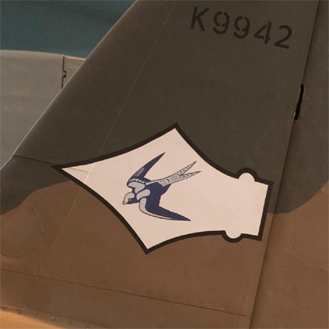 RFC "Nose Art"
This was adapted from 72 Squadrons early unofficial emblem consisting of a quartered shield depicting a foaming tankard, a scroll of 'bumph', a heart pierced by an arrow and five aces, one of them a joker. This is our approved WWII arena "SWIFT" 72 Sqn. RAF "Nose Art"
K9942 is currently on display at the RAF Cosford Museum.